I bought a bike at a significant discount, only to discover later that the discount means no actual setup work is done on the bike at all - you even have to assemble some of it yourself, though fortunately the more complicated parts come preassembled. I figure most people who buy bikes there bring the box to a mechanic shop and have them set everything up, I dunno. Anyway... after expending some of my profanity allowance I managed to finally set the disc brakes right (with some reservations, of which more in a likely future post), and then I had at the derailers, since in stock form the chain would jump and grate on the guides all the bloody time. I finally managed to set them in an acceptable way, but acceptable is not the same as "great". No amount of adjusting I do fixes it 100%. If I adjust it so it doesn't make noise on 4, it makes more in 6, and vice versa. 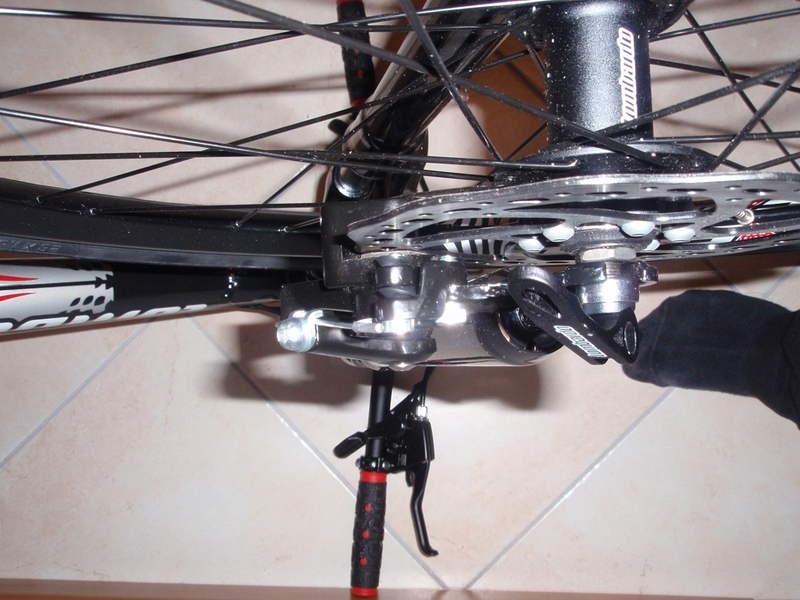 This is not normally a problem, because you usually use the bycicle in the first 3 configurations, but it occasionally happens that you use one of the other ones, and when I hear the chain touch the guide it irritates me. I'm unsure if I should expect this. My other bycicle (which I have at my mom's place) never did this, but then it cost three times as much as I paid for this one (it was a present), so it should be obvious that it has higher quality components. The one I'm working on now was quite cheap considering it has disc brakes and full suspension, so maybe they skimped on the drivetrain? The derailers are Shimano. Front: SI-6NMFA-003; rear: SI-6NMRA-002. Just take the bike to a shop and ask them to help. may cost you a few$$ but this will eliminate your problems. You get what you pay for. Lesson learned. Yea, if you are starting at Zero mechanical experience, drop the bike off at your local Bike shop. Make friends with them, they are part of your community. one of those will guide your DIY tool purchase and use. Those bikes "at significant discount" are really the province of the reasonably competent bike mechanic if there is any hope of keeping the cost low. Once you need professional help, the cost savings are pretty much gone. The alternative is to pay your dues by studying bike repair manuals and web sites and collecting the needed tools to do the work yourself. At least this "payment" will return dividends in the future. Was this a Bikes Direct purchase by any chance? I'm handy at mechanical work, I have the tools, I firmly believe in DIY and I've already performed repair on the other bike, not to mention moped and motorcycle. I have no trouble getting my hands dirty. In fact, when I found out I had to set the bike myself, I thought "a challenge! I'll take it", though I expected derailers to be easier to adjust. I'm in the process of doing exactly that. As I said, some I've already done. It was from an Italian non-internet store. Referring to your itemized list, items 4, 5, and 6 pretty much describe "cross-chaining", and the driveline is really not meant to be operated in that manner. What you describe in your items 1, 2, and 3 are OK, and is where the driveline is happy. if you do the math, the ratios will be redundant, in the overlap of cross chained combinations. so, most likely, the gear you want is in a combination in a better chain-cog alignment. as the others have said, there is really nothing wrong with how you've got it setup, it's not meant to run in the big big combos and the small small combo's. depending on the shifters you are using, there may be a "trim" position on the front shifter to alleviate this issue to some degree but that would typically only be on the smallest chain ring. In other words, they ain't mountain bike parts, you said that it has disc and Full suspension, if it has Atlus as the drive train, then the whole bike will be pretty budget, great for riding round parks, but will not work will if you take it off road, guessing it's pretty heavy as well. Would suggest if you can't return it, take it as a learning experiance, in knowing what you are buying, what you will get, and how to fix what you get if it isn't what you expected. I've no problems with any of that. I replaced the knobby tires with road ones explicitly because I don't need it for offroading. I'd have considered buying a city bike but for two things: 1) I tend to have a fairly aggressive riding stance not very suitable for the relaxed position of a citybike, and 2) MTBs are the only bikes available around here with disc brakes. Speaking of which: I had my first go at riding it yesterday (heavy rain made it impossible to test it earlier), and while the drivetrain works fine, the braking power was definitely too weak. I think this has more to do with my inexperience at adjusting disc brakes than with the brakes themselves. Well, at least, I hope so - the alternative is that the brakes are worse than rim brakes in department-store kiddie bikes. I've tweaked the caliper position and the fixed pad to be as close as they can be without the disc rubbing on them during normal non-braked operation, and I've repositioned the bowden cables so they pull harder (again, as much as possible without rubbing); this improved things, but braking power is still barely sufficient. I can't help but think I'm doing something wrong. Any suggestions, other than just tossing the calipers and swapping in better ones (I'm keeping that as the last-ditch solution)? I was perfectly aware I wasn't buying a top-quality product, and I expected to have to do some fixing. I just thought there was less cursing involved in the whole process. Last edited by Fallingwater; 03-22-11 at 10:53 AM. i'm little confused, if you wanted a road bike with a disc brake you definately sould have been testing it out in the rain. take your bike outside with a full water bottle and soak your rotor then go ride for a couple of blocks with the brakes on and break them in and see if that helps. They do have to be adjusted properly to get full stopping power, but that's easy to do, unless you consider an Allen wrench to be a baffling high-tech gizmo. And when adjusted properly they do not rub the disc all the time as some have erroneously written. There's no contact at all. Adjustment is really just common sense: Loosen the caliper mounting bolts. 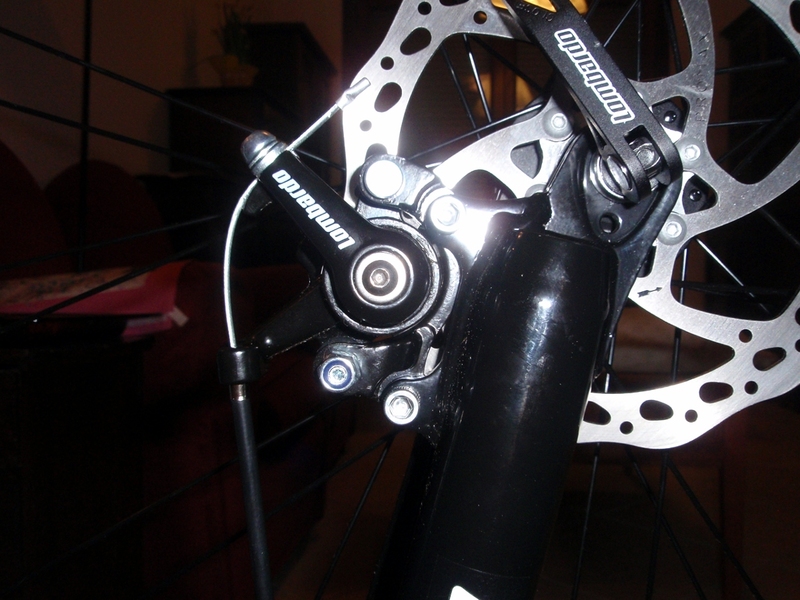 Adjust both pads toward the disc an equal amount until they're both touching the disc, squeeze the brake lever to align the caliper body, and then tighten the mounting bolts. This centers the caliper body on the disc and gets the pads parallel with the disc. Then simply adjust both pads out so they're as close as possible to the disc without rubbing, which can be easily heard when you spin the wheel. The caliper body has a tiny Allen wrench screw on the side that locks the inner pad adjustment. It needs to be loosened before adjusting the inner pad. I have a new bike with 9x3 gearing. It's a good brand & was bought from a good shop. Of the situations listed, (5) is the only one I might encounter intentionally. I have to trim the FD manually in this circumstance. The FD shifter is non-indexed, I assume for this reason. Just something more to be mindful-of when shifting, not a big deal. Think about this - the traditional rim brake IS a disc brake (with spokes), and a really large diameter one. 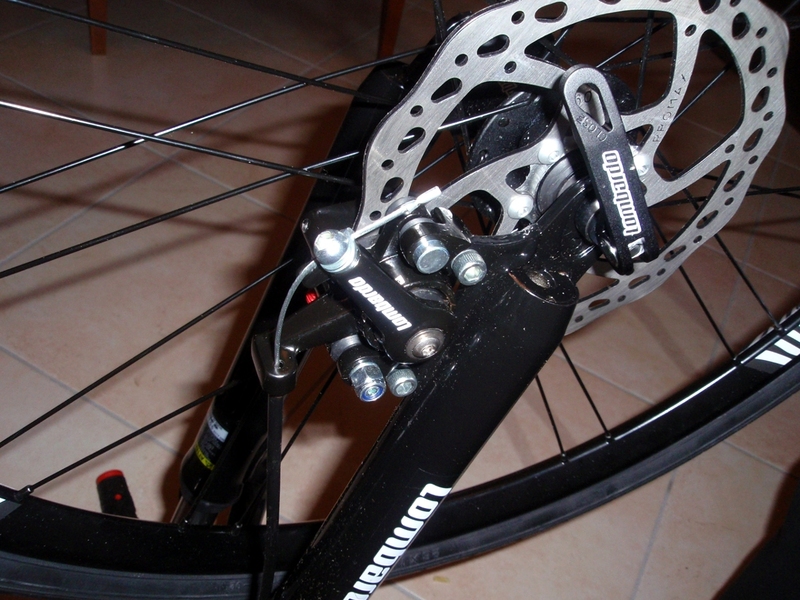 The mechanical advantage of the rim brake is huge. With the new 'disc brake' (small diameter rotor), the much larger wheel has the mechanical advantage. So, the friction area and pressing force of the 'disc brake' has to be increased to compensate. Perhaps in the case of your bike the leverage provided by the design of the parts is a little less than nominal. I like 'motobecane69's comment about breaking in the pads and rotors. You have to do this with rim brakes too, and like rim brakes, any kind of oily contamination will have a major effect on stopping power. Make sure the friction surfaces are completely clean with no residues, and find some hills for burning in the brakes. Do a few hard stops by holding the pressure steady until the bike completely stops. Avoid easy stops at first to prevent 'glazing' the pads. Ok, after a lot of cursing I've finally managed to get the forward brake to actually work, but the rear one keeps mistyfing me. If I set it so it brakes, the pads touch the disc slightly during normal non-braked operation. If I set it so the pads don't touch the disc at any time, it has weak braking power and the lever needs to be squeezed to the very end. This is starting to get frustrating. On a side note, I removed the pads and I found them slightly pitted. I thought new pads had to be spotless? I think they're very slightly out of true, because when the brake is set so it actually brakes I can hear the pads touching the disc once every wheel revolution. I say "very slightly" because when the touching occurs all that actually happens is noise - the wheel doesn't slow down noticeably even when I free-spin it, so no significant braking goes on. This... isn't good, is it? Bumpty. I don't know if I should bring the pads back to the store and ask for replacement or not. I've been googling for pictures of new pads, and it seems some come pre-pitted by design (example, example 2). Pitting in the pads isn't anything to worry about, the pits will disappear after a bit of braking. A warped rotor that deflects 0.5mm can affect how the brake is set up and how well it performs. 0.5mm, 0.75mm, 1mm, etc, are small numbers and mightn't seem much but it's a fair bit when you consider that a brake caliper might only have a gap of 4mm of which a 2mm rotor fits between and the maximum 30mm or so that the Torque Arm (caliper arm) moves will only equate to 2mm maybe 2.5mm of Outboard Pad movement. The clearance between the pad/rotor so there's no rub is another measurement to add to the equation, the bigger the distance the more lever pull. When pad/rotor clearances are subtracted from the 2mm or so that the outer pad can move it will take a lot more lever pull to get full pad/rotor connection on a warped rotor than a true rotor. With a 1mm rotor warp and 0.5mm of pad/rotor clearance on each side so there's no pad/rotor rub a brake lever would basically need to be pulled all the way in to get full pad/rotor connection. A true rotor with the same clearances, the lever would only need to be pulled half way to get the same pad/rotor connection. It may take anywhere from 20 to 40 complete stops to break in pads. You may begin to notice an increase in braking power after the first ride. Brake noise can occur not only during the break-in period but off and on throughout the life of the brake pads. Noise is dependent upon factors such as brake setup, rider weight, riding style, braking style, and riding conditions (i.e. dust, soil, and contamination of friction surfaces). Yeah, I figured the thing about disc truing - I'm going to true them as soon as I can, hopefully I don't need any specialist tools. As for cross-chaining: I'm ok with keeping it like it is if the behaviour is expected. The old bike can crosschain with no rubbing on the derailers at all (not that I intentionally crosschain often, mind you), but then that drivetrain was expensive and this one isn't, so it's OK.
Truing the rotors and readjusting the calipers yielded a considerable increase in braking power. I can now use it fairly safely, but there's one detail that's still nagging me: the brakes seem a lot more... spongy, for lack of a better term, than the rim brakes on the other bike. Even if I pull the levers with all my strength, braking doesn't instantly happen at maximum power - it takes a fraction of a second for the brakes to go to full strength. It this something I should expect of a disc brake system? I was under the impression that, if anything, they should be more instant than rim brakes.